Awwww, Solid Snake is so tiny. And so is Gray Fox. I sure hope nothing bad happens to either of them, ever. 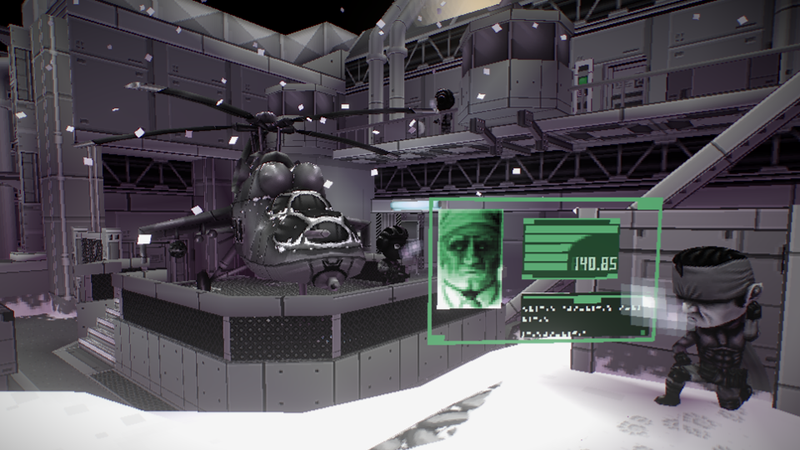 This interactive chibi-fied diorama of Metal Gear Solid 1 was put together by Glenatron, and it's full of nice little touches. It nails the basic style of MGS 1 while also making everyone look like adorable gnome children with debilitating smoking habits. It's pretty great. There's the opening scene, some basic sneaking, skulking around under cardboard boxes, Snake's duel with Gray Fox, and the classic final showdown against Liquid Snake. Try zooming in on the buildings. You might find some secrets. The whole thing is pretty neat, a trip down memory lane if memory lane were more of a memory anthill that you can poke with a stick. I hope people do more of these.